» Characters from DFW #9: THE PATENT LEATHER KID — by Monte Herridge. Characters from DFW #9: THE PATENT LEATHER KID — by Monte Herridge. #9. 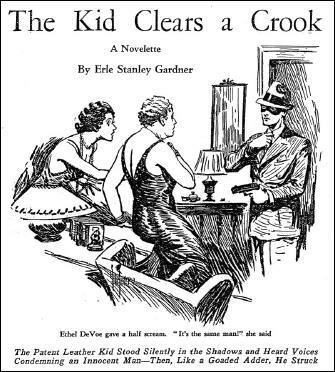 THE PATENT LEATHER KID, by Erle Stanley Gardner. 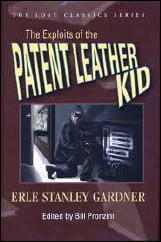 The Patent Leather Kid is another leading character created by Erle Stanley Gardner. 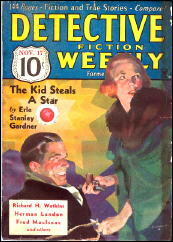 Someone with that identity first appeared in “The Gems of Tai Lee,” a story in the March 25, 1930, issue of Clues, but when the Kid showed up again, in the May 28, 1932, issue of Detective Fiction Weekly, he was a new character, the star of the first of a series of adventures that ended two years later. He had a dual identity in the DFW stories – normally rich Dan Seller most of the time, and The Patent Leather Kid when he is ready for one of his somewhat illegal adventures. The patent leather in the name comes from his wearing not only patent leather shoes but also a patent leather face mask to hide his identity. There is a cast of regular characters for each of his identities. The stories usually start out with a scene of Dan Seller and his fellows at their club, discussing the latest criminal event or activity. The other club members are firstly Police Inspector Phil Brame, then Renfroe the bank president, and Bill Pope the explorer. Brame usually brings up a criminal event, which causes disagreement among the others and ends with Seller or Bill Pope often betting on the outcome with him. Brame always loses these bets, but that does not keep him from trying again. Renfroe agrees with the Inspector much of the time, but also tries to avoid antagonizing Seller because he is a large depositor in his bank. It is not revealed how well off Dan Seller is, or where his money comes from. In his identity of the Patent Leather Kid, he has another group of people. There is Bill Brakey, The Kid’s bodyguard and assistant. He is also called “A walking encyclopedia of the underworld,” and this comes in handy for The Kid’s adventures. Brakey usually knows the answer to any question about the underworld, or can get the information easily. Another person in this group is Gertie, the telephone operator in his apartment house. She keeps track of his messages and also keeps an eye on The Kid’s special elevator which was constructed for his own use. She also knows his identity as Dan Seller. Interestingly, Gertie is also the name of Perry Mason’s telephone operator. There are only three people in the apartment house hotel who know Dan Seller’s dual identity: Bill Brakey, Gertie, and the desk clerk who is never named. The stories involve various kinds of adventures. In “The Kid Clears a Crook,” a reformed criminal trying to go straight is framed and taken advantage of by underworld crooks, and the police don’t care. The Kid sets out to clear the ex-crook and set the blame where it belongs, thereby infuriating both the underworld and the police. Neither group likes interference from The Kid in their affairs, and try repeatedly to eliminate him. The police even (according to Inspector Brame) give the underworld the green light to eliminate The Kid, but this never happens. Brame even states that if they catch the Kid, they will frame criminal charges on him in order to keep him in jail for a long time. The Kid enjoys this, in his words: “In this game of matching wits with the law, The Patent Leather Kid found his most fascinating recreation. He gambled with life and liberty, and enjoyed the game.” (The Kid Stacks a Deck) So the acquisition of money or property gained illegally is definitely not the goal of The Kid. The first story to appear in DFW, “The Kid Stacks a Deck,” is a bit different than the others in the series. Bill Brakey does not appear in this story, and Gertie is present but not named. Inspector Brame is given the title of Commissioner, which he loses in later stories. Possibly the author thought the stories more effective with a lower ranking policeman. In the story, The Kid finds out that a criminal gang is out to kill him, so he sets a trap for them. He breaks into a jewelry store, steals a few items and mails them to Brame and his family. The gang is waiting outside to shoot and rob him as he leaves. However, The Kid alerts the police who attack and wipe out the gang as The Kid escapes. Inspector Brame’s chief complaint about The Patent Leather Kid was that his activities damaged the dignity of the police and made them look bad and caused people (and The Kid) to laugh at them. That was a terrible offense to Brame. He seems to have cared more about the dignity of the police department than anything else. In “The Kid Throws a Stone,” The Kid is involved in a case where someone is impersonating him. The impersonator has already pulled one robbery before the real Patent Leather Kid starts his complex counter-offensive. In another case of impersonation told in “The Kid Wins a Wager”, a criminal burglarizes a jewelry story and leave a note supposedly signed by The Patent Leather Kid. Fortunately, The Kid catches him in the act and clears that up. One of The Kid’s favorite tactics was to get criminals, who are after him, into confrontations with the police, where they invariably wind up shot. Rarely does The Kid have to use a gun on the criminals themselves, but this does occur in the story “The Kid Cooks a Goose,” where he and Bill Brakey are trying to protect a woman from a gang of killers. They shoot it out with the three killers and wipe out the gang. 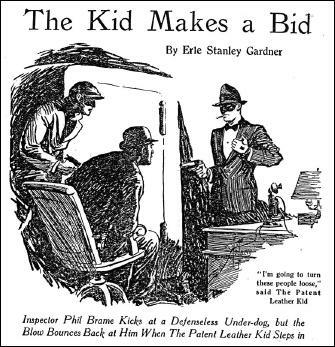 NOTE: The 13 stories that appeared in Detective Fiction Weekly have been collected in The Exploits of the Patent Leather Kid, edited by Bill Pronzini (Crippen & Landru, 2011). 1. SHAMUS MAGUIRE, by Stanley Day. 2. HAPPY McGONIGLE, by Paul Allenby. 3. ARTY BEELE, by Ruth & Alexander Wilson. 4. COLIN HAIG, by H. Bedford-Jones. 5. SECRET AGENT GEORGE DEVRITE, by Tom Curry. 6. BATTLE McKIM, by Edward Parrish Ware. 7. TUG NORTON by Edward Parrish Ware. 8. CANDID JONES by Richard Sale. Nice study as always, Monte. I’ve never read any of these stories, but the Kid sounds a bit close to some of McCulley’s gentlemen crooks. It might be fun reading them. I’ll have to look up Bill Pronzini’s book. This has to be the first time that the stories in one of Monte’s columns are going to be found easily, and all in one place. If you were to try to find all thirteen of the magazines these stories were in, it would take you nearly forever, or close to it. It would also be a lot more expensive — but might be worth it, considering all of the other stories you’d get to read. In the mid-twenties this was the title of a boxing film. Quite successful. “THE PATENT LEATHER KID ranks among the great silent films. Based on the best-selling novel by Rupert Hughes, this long and ambitious film is almost two films in one. There doesn’t seem to be any other resemblance between the film, which came first, and Gardner’s character. Even the reasons for ‘Patent Leather’ in their names are different. For what it’s worth, before I read one of the stories in the series, I thought it had something to do with his shoes. Just thought Gardner must have been aware of the Barthelmess film, liked the title-concept and applied it in a different way. The film was very popular. I’m sure Gardner must have been aware of it. Even though I didn’t some up with any other similarities between the characters, your hypothesis is a good one. That he took the name and tinkered around with it a little, I could believe it. The basic concept behind Gardner’s rogues reminds one of C.G. Jung ‘s figure of the ‘ Heldenkind’. Heldenkind translates to “Hero Kid,” am I correct? YUP, Steve, I don’t know the English termini technici in analytical psychology, and do not adhere to it, but understand the fascination emanating from it, in being the sole serious school, that embraces something metaphysical. You will probably want to make a small revision to your article. “The Gems of Tai Lee” story that appears in Clues, March 25, 1930 is not a Patent Leather Kid story. The character goes by the name Patent Leather Kid but he is not the same series character profiled in your essay, hence the reason it was left out of the collection The Exploits of the Patent Leather Kid, edited by Bill Pronzini. Pronzini for some reason does not mention this reason in his introduction. Thanks, Rob. I’ll make a note of this in the article itself. I’d meant to inquire further about this, but time — as usual — got away from me. LATER THE SAME DAY. Monte has pointed out that the first paragraph also needs to be rewritten, which we’ve done.